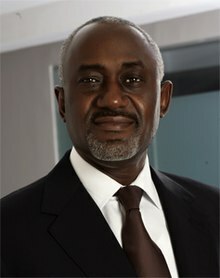 Oluwagbemiga "Gbenga" Oyebode MFR (born 30 March 1959) is one of the founding partners and Chairman, Management Board of Aluko & Oyebode. A lawyer by profession, he specialises in advising major corporations on matters relating to Oil and Gas, Power, Foreign Direct Investment, Privatisation, Telecommunications, Project Finance and Aviation. Gbenga had his secondary school education at Christ's School, Ado Ekiti. He proceeded to study law at the University of Ife (now Obafemi Awolowo University) where he graduated with a Bachelor of Laws (LL.B) degree in 1979, and he was admitted as a barrister and solicitor of the Supreme Court of the Federal Republic of Nigeria in 1980. He went on to obtain Master of Laws (LL.M) degree at the University of Pennsylvania in 1982. He was previously employed by White and Case in New York City as an associate between 1982 and 1983 after which he worked at Gulf Oil (now Chevron) in Houston, United States. Gbenga co-founded Aluko & Oyebode with Bankole Olumide Aluko, SAN in 1993 after leaving Ajumogobia, Okeke, Oyebode and Aluko (Barristers, Solicitors and Notaries) in 1992. Gbenga is currently the Chairman of CFAO Yamaha Motor Nigeria Ltd. and Okomu Oil Palm plc. He also serves on the Board of MTN Nigeria Communications Limited and Nestle Nigeria plc. He is on the Africa Advisory Committee of the Johannesburg Stock Exchange. He is also a Fellow of the Chartered Institute of Arbitrators and a member of the Nigerian Bar Association, the American Bar Association and the International Bar Association. He was from 2012 to 2014, Chairman of the Nigerian Bar Association’s Section on Business Law (NBA-SBL). On 30 July 2015, he retired as a Director and Chairman of Access Bank plc after 13 years of taking leadership roles at the Bank. In 2001, Gbenga was conferred with the Nigerian National Honour, Member of the Order of the Federal Republic of Nigeria (MFR) by the Nigerian Government and he also holds the Belgian Royal Honour of "Knight of the Order of Leopold". On 27 June 2015, he was distinguished with an award for Lifetime Contribution to Law by Law Digest Africa Awards. Gbenga is the Chairman of Teach for Nigeria, an organisation that focuses on developing a movement of leaders across the nation who are committed to putting an end to educational inequity. ^ "Gbenga Oyebode, MFR - Nigeria Oil & Gas Industry Lawyers _ Aluko & Oyebode". Aluko & Oyebode. Aluko & Oyebode. Retrieved 9 July 2015. ^ "Gbenga Oyebode MRF Profile". Who's Who Legal. Who's Who Legal. Retrieved 9 July 2015. ^ "Gbenga Oyebode Profile". Martindale Hubbel. Martindale Hubbel. Retrieved 9 July 2015. ^ "Christ's School Old Students". Ekiti.com. Ekiti.com. Retrieved 9 July 2015. ^ "About Gbenga". The Economist. The Economist. Archived from the original on 2015-07-11. ^ "Gbenga Oyebode". Speaker Series Africa. Speaker Series Africa. Retrieved 9 July 2015. ^ "About Us - CFAO Yamaha Motor Nigeria Ltd". CFAO Yamaha Motor Nigeria Ltd. CFAO Yamaha Motor Nigeria Ltd. Retrieved 13 June 2016. ^ "MTN Group Ltd (MTN:Johannesburg Stock Exchange)". Bloomberg Business. Bloomberg Business. Retrieved 9 July 2015. ^ "Gbenga Oyebode: Nestle Nigeria Plc". Reuters. Reuters. Retrieved 9 July 2015. ^ "8th Section on Business Law Annual Conference". Nigerian Bar Association Section on Business Law. Nigerian Bar Association Section on Business Law. Retrieved 9 July 2015. ^ "Oyebode Retires as Access Bank's Chairman". ThisDay Newspaper. Archived from the original on 15 September 2015. Retrieved 31 July 2015. ^ "Nigerian national awards 2001". Nigerian Muse. Nigerian Muse. Retrieved 9 July 2015. ^ "Belgian honour: Oni happy for MTN chief". The Nation Newspaper Nigeria. The Nation Newspaper Nigeria. Retrieved 9 July 2015. ^ "Gbenga Oyebode, MFR of Aluko & Oyebode – Life-time Contribution to Law". Law Digest Africa Awards. Law Digest Africa Awards. Retrieved 9 July 2015. ^ "Board & Advisory Council, Teach For Nigeria".